Following a hugely impressive junior career, Ding wasted no time in making a similar impact on the main tour and became only the third player ever to win three ranking event titles before his 20th birthday. Ding at his best has an excellent all-round game and remarkably made over one hundred career centuries in just his first five years on the tour. Following a couple of defeats to Jimmy White and notably Ronnie O’Sullivan in the 2007 Masters final however, for some time his temperament appeared questionable with the result that he entered the 2009 World Championship in real danger of losing his place among the top 16. Having managed to do enough to remain amongst the elite though, Ding has since gone from strength the strength as evidenced by victories at the 2009 UK Championship and 2011 Masters. Having started playing snooker at the age of nine, by the time Ding was fifteen he was already skilled enough to win the Asian under 21 championship, Asian Championship and IBSF World Under 21 Championship in 2002. His rapid progress continued on the main tour where having turned professional in 2003, he recorded an impressive win over Joe Perry on his début at the Wembley Masters before losing in the second round to Stephen Lee in 2004. His big breakthrough was to come at the 2005 China Open however where as a wildcard he remarkably managed to capture his first ranking event title, defeating Stephen Hendry in the final. 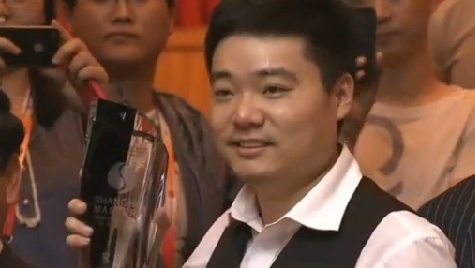 This victory not only significantly raised his profile, but helped spark the snooker boom in China that we have seen during the following years. 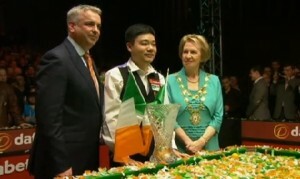 During the next couple of seasons Ding was able to prove that this was no fluke by winning the UK Championship and Northern Ireland Trophy – all before he reached the age of 20 – a remarkable achievement matched only by Ronnie O’Sullivan and John Higgins. Returning to London for the Wembley Masters, Ding started the tournament in fine form, making his first career 147 in his opening match against Anthony Hamilton before going on to reach the final where he would face local favourite Ronnie O’Sullivan. 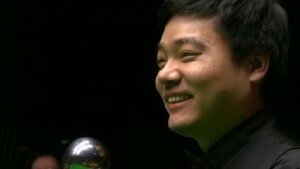 Despite making a strong start to the match, Ding soon found himself overwhelmed by a combination of O’Sullivan’s incredible play and the boisterous, hostile home crowd. This continued to a point where Ding appeared to have all but given up and in fact tried to concede the match with O’Sullivan still one frame from victory. He continued after the mid-session interval however and his ‘concession’ was attributed to him thinking that the final was a best of 17 match. This was not the first time that Ding had appeared vulnerable to a partisan crowd however as during a Premier League match against Jimmy White just three months previously, he appeared to again struggle to cope with the atmosphere, losing the match 5-1. Despite victory in the World Series event in Warsaw, Ding’s results in ranking events continued to be indifferent and questions continued to be asked regarding his temperament. One highlight though was to come at the 2008 UK Championship when during the third frame of his match against John Higgins, he made the second maximum break of his career, becoming only the 11th player to do so. 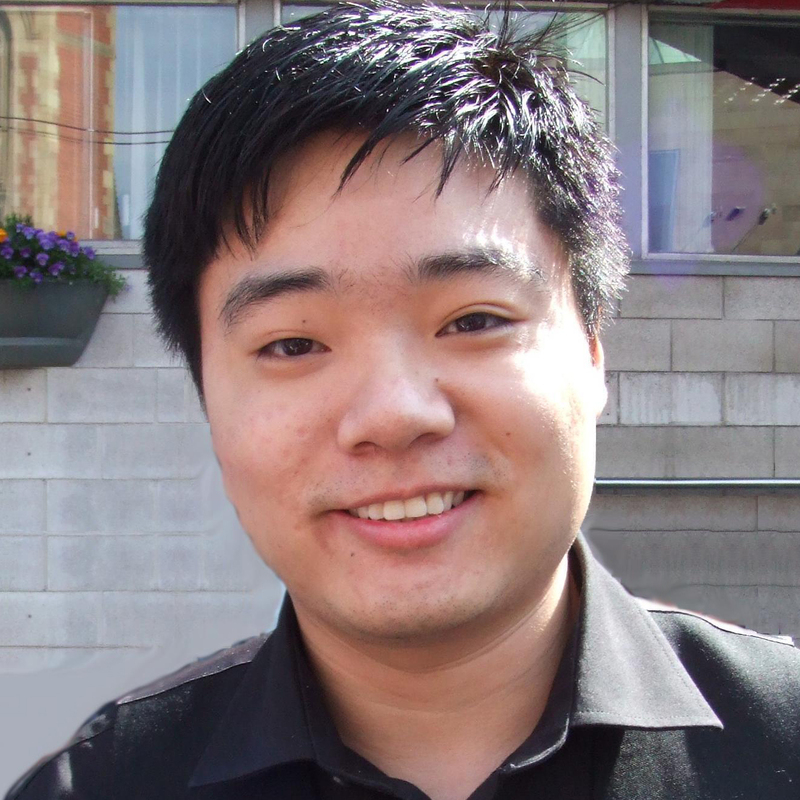 Because of his previous poor results, Ding headed into the 2009 World Championship in need of a win to be sure of retaining a place inside the top 16. Drawn against friend and countryman Liang Wenbo the match was to prove an inevitably high pressure affair and at 8-7 down having lost the previous four frames, it looked like once again Ding would succumb to it and suffer yet another damaging defeat. What came next however was a demonstration of Ding’s temperament as from seemingly nowhere he rattled in breaks of 111, 91 and 63 to complete a tremendous victory. Though he was to lose out to Stephen Hendry in the last 16 just as in 2008, he had nevertheless given a good account of himself and as Stephen was to comment after the match, his attitude looked to be 100% better. Buoyed by his improved run at the Crucible, Ding reached the final of the 2009 Jiangsu Classic before starting the ranking event season with a quarter-final run in the Shanghai Masters before he was stopped by eventual champion Ronnie O’Sullivan. It was the Grand Prix however which was to mark his return to the business end of tournaments as he reached his first ranking event final since the 2007 Northern Ireland trophy with victories over Matthew Stevens, Stephen Maguire, Peter Ebdon and Mark Williams. After a competitive first session however he could not hang on to an inspired Neil Robertson in the evening as the Australian ran out a 9-5 winner. Impressively though Ding was again able to shine in Telford at the UK Championship, notably recovering from 7-5 down against Ali Carter in the last 16 on his way to a second straight ranking event final. Against a weary John Higgins (who had somehow repelled a six-frame winning streak from Ronnie O’Sullivan the previous night), this time Ding was to emerge a 10-8 winner to take his second UK crown and lay down a marker for the rest of the field that he was back. The second half of Ding’s season was not to prove as spectacular as the first but he was able to reach his third final of the campaign at his home tournament in Beijing before losing out to a resurgent Mark Williams. With him appearing to be back to his 2005/6 best once again, many were tipping Ding to do well at the World Championship and following a 10-1 victory over Stuart Pettman in the opening round these predictions looked to be well founded. Unfortunately for Ding however he was to lose out at the last 16 stage for the third season in a row as 2005 world champion Shaun Murphy put in an impressive performance to win 13-10 and end Ding’s season. Despite this disappointment however it was overall a fantastic season for Ding which saw him reach more finals and amass more ranking points than any other player. As a result Ding finished the season ranked at a career high position of number five. Following his 6-0 defeat to Mark Allen in the 2009 final, it looked like Ding would regain the Wuxi Classic title at the start of 2010/11 as he raced into an 8-2 lead against his Crucible conqueror Shaun Murphy. Unfortunately for Ding however it was not to be as a fantastic display from Murphy saw him win seven frames in a row to complete an unlikely comeback. 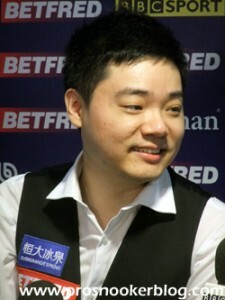 As the ranking event season began with the Players Tour Championship events, Ding was a notable absentee from the first five events and this appeared to have an effect during the first few tournaments that he did play as a number of mediocre displays, notably against Shaun Murphy in the Premier League, saw him slip to number eight at the first seedings revision in October. Ding however did show some form during the PTC5 event as he defeated Welshman Jamie Jones 4-1 in the final to take the trophy and 2,000 ranking points to go with it, lifting him to third place in the latest provisional rankings. 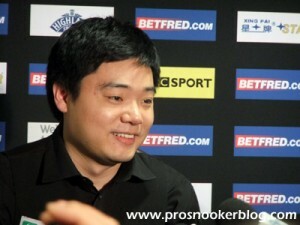 His next major success though was just around the corner as he took the first big title of 2011, the Wembley Masters. In a tournament that saw seven of the top eight seeds crash out in round one, Ding looked to be in form from an early stage and saw off Mark Williams, Graeme Dott and Jamie Cope to reach his second Wembley final. Four years after that infamous implosion at the hands of Ronnie O’Sullivan at the same venue there was to be no mistake as Ding defeated Marco Fu 10-4 to take the title. Leading 6-2 after the first session, he withstood a brief fightback from his opponent, taking the 11th frame having needed a snooker on the pink give him the momentum to carry him to victory. Following this success Ding was also to break new ground at the World Championship in Sheffield as he made it through to the semi-finals for the first time before losing 17-15 to Judd Trump. What made his run all the more impressive was a fine comeback from 12-9 down against Stuart Bingham at the last 16 stage in front of a large number of Chinese spectators in Sheffield. 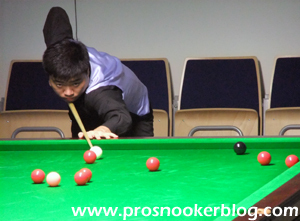 A run to the final of PTC2 aside, Ding made a poor start to the 2011/12 season as he lost his opening matches at both the Australian Open and Shanghai Masters tournaments, while he also opted to sit out many of the PTC events staged, playing just enough to ensure that he would qualify for the Grand Finals in Galway later in the season. Improvement was to come at the UK Championship where he defeated Mark Davis and Matthew Stevens, both 6-5, to reach the quarter-finals before he lost out to Neil Robertson 6-2. 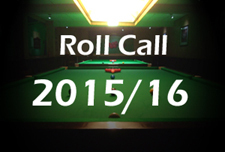 Ding also lit up the baize in December by making not just one, but two maximum breaks in the space of just three days at the PTC11 and PTC12 tournaments. Taking his career tally to four, he became at the time just the fourth player after Ronnie O’Sullivan, Stephen Hendry and John Higgins to have made more than three maximum breaks during his career. In 2012, Ding recovered from a premature end to his Masters defence at the hands of Ronnie O’Sullivan, by taking his fifth ranking event title at the Welsh Open in Newport with a 9-6 victory against world number one Mark Selby. Shortly afterwards, Ding followed up this success by becoming the fifth winner of the Championship League, defeating Bristol’s Judd Trump 3-1 to claim the title and a place in the Premier League. Ding’s season was however to end in disappointment at the World Championship, a 10-9 defeat to Ryan Day in the opening round having at one stage led 9-6, as well as having been in the balls with a match-winning chance in the decider. Again electing not to enter a number of the season’s European PTC events, Ding Junhui experienced a relatively quiet start to the 2012/13 season, but did perform well in the new APTC events, reaching the final of the second where he lost out to Stephen Lee. He also played well in the other PTC events that he did choose to enter, winning the ET5 event in Ravenscraig just before Christmas, as well as reaching the semi-finals of UKPTC4, where he lost out to Judd Trump. His ranking however was to drop, as he struggled for form in the year’s full-ranking events. In fact his best results prior to the turn of the year were to be last 16 runs at the Australian Goldfields Open and International Championship, while he crashed out in the first round of the Wuxi Classic, Shanghai Masters and UK Championship tournaments. Moving into 2013, Ding’s form and results began to improve as he won the third group of the invitational Championship League event, before reaching the semi-finals of the Welsh Open in his title defence, losing a decider to Stuart Bingham. A quarter-final run followed at the Haikou World Open, before he then underlined his return to form by taking his sixth ranking event title at the 2013 PTC Grand Finals in Galway. There he defeated Andrew Higginson, Anthony McGill, Mark Allen and Kurt Maflin to reach the final, where he would come back from 3-0 down to defeat Australia’s Neil Robertson 4-3 to take victory. As the season reached its climax, he made it through the semi-finals of the Championship League before losing 3-0 to eventual champion Martin Gould, before suffering a 5-3 defeat to Barry Hawkins at the opening round of the China Open in Beijing. At the Crucible he then defeated Alan McManus and Mark King to reach the quarter-finals of the World Championship for only the second time in his career. 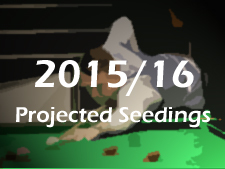 Unfortunately for Ding however, he was to be denied by Hawkins for a second successive event, losing 13-7. Ding was to make history during the 2013/14 season, as he equalled Stephen Hendry’s record of winning five ranking events in a single campaign, including three in a row, a feat not previously achieved since Hendry in 1990. His first success was to come at the Shanghai Masters in September, where he defeated the likes of Neil Robertson, Barry Hawkins and finally countryman Xiao Guodong 10-6 to claim his first ranking title in China since his maiden triumph in Beijing back in 2005. Though he lost out to Mark Allen in the final of the ET5 event, further success followed in India, as he whitewashed home favourite Aditya Mehta to claim a second successive full-ranking event title. The hat-trick was to follow in Chengdu at the International Championship, as he edged out Marco Fu 10-9 in a thrilling final, during which Ding at one stage hit three consecutive century breaks. Defeats to Ricky Walden and Shaun Murphy at the UK Championship and Masters tournaments were to bring Ding’s winning run to an end for a short time, before he was back in the winner’s circle at the German Masters, coming from behind to defeat Judd Trump and win a fourth ranking event title of the season. As he made it to the final of the Welsh Open it appeared as though Ding might win the title for a second time in Newport, but he was to prove powerless to stop reigning world champion Ronnie O’Sullivan, falling 7-1 behind after the first session, before Ronnie sealed victory with a memorable 147 break. A record-equalling fifth ranking title was to follow however, as he defeated Neil Robertson 10-5 to win the China Open for a second time in Beijing. 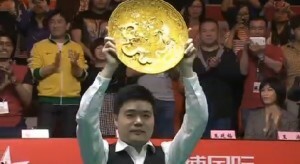 With so much success under his belt already during the season, Ding headed into the World Championship as provisional world number one and one of the favourites for the title. Once again however, there was to be disappointment for Ding in Sheffield, as he fell victim to one of the greatest upsets of all time at the Crucible, losing out 10-9 to Michael Wasley in a deciding frame. The result, combined with Mark Selby’s run to the title meant that Ding would not finish the season ranked at number one, although he would move up to a career-high second place. Ding made a strong start to the 2014/15 season with victory at the Asian Tour one event, before reaching the semi-finals of the Shanghai Masters in August, losing to eventual champion Stuart Bingham. From there however his season was to prove extremely disappointing for Ding, surprise defeats to the likes of teenager James Cahill at the UK Championship, Lee Walker at the Welsh Open and amateur Weng Zepeng at the International Championship qualifiers increasing the pressure upon him as the season progressed. He did however show signs of a return to form at the end of the season, making it through to the semi-finals of the China Open, losing to Gary Wilson in a deciding frame, before he defeated Mark Davis and John Higgins at the World Championship to set up a quarter-final with Judd Trump. Unfortunately for Ding, he was to suffer a 13-4 defeat at the hands of the man who defeated him in the semi-finals four years earlier and would finish the season down two places to fourth, with the majority of his ranking points due to fall over the course of the following 12 months.